For all of those networks and newspapers who annually pretend the March for Life does not exist, we shall see if a Washington rally by thousands of atheists is considered equally as "newsworthy." Don't empty your wallet betting on that. Advertised speakers at the March 24 "Reason Rally" include Congressman Pete Stark, author Richard Dawkins ("The God Delusion"), comedians Paul Provenza and Jamie Kilstein, "Mythbusters" co-host Adam Savage, the rock band Bad Religion and the hip-hop artist "Rational Warrior a.k.a Tombstone Da Deadman," and Jamila Bey ("former editor and producer for National Public Radio"). In her April 1 Washington Post story, staffer Krissah Thompson explored how the "mission" and "challenges" of the Congressional Black Caucus have "evolved" from its initial aim "to eradicate racism." Yet nowhere in Thompson's 23-paragraph article is any mention of how the CBC has denied entry to prospective members on the basis of skin color, such as liberal Democrats Steve Cohen (Tenn.) and Pete Stark (Calif.). Could Sen. Jim Bunning's desire to pay for extended unemployment benefits with stimulus funds be the result of a serious mental disorder? So suggested Rachel Maddow during her show last night. Maddow based her report on unfouded allegations from a liberal newspaper, and neglected to mention the numerous unstable congressional Democrats that have come unhinged from time to time. 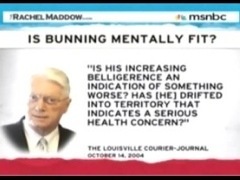 Maddow noted that "even his hometown newspaper has at times questioned his mental fitness," and quoted the Louisville Courier Journal, which in October 2004 asked, "Is his increasing belligerence an indication of something worse? Has [he] drifted into territory that indicates a serious health concern?" The Washington Post's Miranda Spivack downplayed all the irony in her report Friday on a top House Democrat on the tax-law-writing Ways and Means Committee trying to lower his taxes in Maryland by claiming the state as his residence – even as he represents a district in San Francisco. With pressure mounting, Democratic Congressman Pete Stark finally apologized today for his reprehensible statements on the House floor last week. You don't have money to fund the war or children. But you're going to spend it to blow up innocent people if we can get enough kids to grow old enough for you to send to Iraq to get their heads blown off for the president's amusement. Will Pete Stark’s Apology to President Bush Get Reported? As NewsBusters reported Friday, Rep. Pete Stark (D-Cal.) made some rather disgusting comments on the floor of the House last week about kids being sent "to Iraq to get their heads blown off for the president`s amusement." On Tuesday, Stark took to the floor once again, this time remarkably to apologize for his previous statement. As the broadcast networks almost completely ignored Stark's comments Thursday - not one of the evening news programs bothered to report it all - one wonders whether the Congressman's statement today will get any more attention. A few days after 9-11, President Bush, in an impromptu moment on the White House lawn, referred to the war on terrorism as a crusade. What does that have to do with the vile claim Rep. Pete Stark (D-Calif.) made this week that Pres. Bush sends our soldiers to Iraq to have their heads blown off for his "amusement"? Nothing that I can see. But on this afternoon's "Hardball," Chris Matthews dredged up that and a couple other statements from the president's past and staged a segment asking whether they were worse than Stark's line. 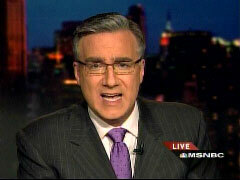 Note the graphic in the screencap, in which MSNBC absurdly asks "who should apologize, Rep. Stark or Pres. Bush?" Did I miss the joke? Was there something funny about what Pete Stark (D-Calif.) said on the floor of the House, claiming that President Bush sends our soldiers to Iraq to get their heads blown off for his amusement? Craig Crawford can apparently see some humor in it. Crawford appeared on today's "Morning Joe," and while the MSNBC political analyst certainly didn't approve Stark's statement, he did try to soft-pedal it, smilingly portraying it as just one more outburst from a congressional scamp. ABC may have set a loathsome new MSM low in insulting traditional Christians. On today's "Good Morning America," the network lumped the "Christan right" with the 9-11 Islamic terrorists as driving people to atheism.